Lucy Joy Engle Alt, age 85, formerly of Cabins, WV, went home to be with her Lord Jesus and Savior on Saturday, December 16, 2017 at Grant Rehabilitation and Care Center in Petersburg, WV. Joy faced her final battle with dignity and looked forward to her arrival in glory land with great joy. Joy was born September 6, 1932 in Cabins, WV and was a daughter of the late Earl Seymour Ours and Mary Frances (Nesselrodt) Ours. In addition to her parents, she was preceded in death by husband, Roy Edward Alt in 2008; one sister, Arvella VanMeter; three brothers, Andrew C. "Bob" Ours, Ronald E. Ours and James D.Ours. Joy graduated from Petersburg High School and worked for Joan Curtis Manufacturing for several years. She was a member of Cabins Assembly of God Church and was a devoted Christian, a devoted Mother, Grandmother and friend. Her greatest joy in life was her family. 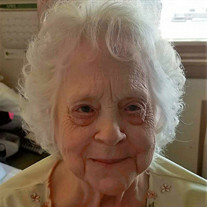 Joy is survived by her son, Matthew O. Engle and wife Joyce of Cabins, WV; her daughter, Teresa A. Barr and husband Donnie Barr Sr. of Petersburg, WV; three grandchildren, Donnie Barr Jr. and wife Suenette of Petersburg, WV, Brent Barr and wife Amanda of Martinsburg, WV and Brian Engle and wife Angie of Maysville, WV; nine great grandchildren; one great-great grandson, Rayden; her brother, Paul M. Ours and wife Mabel of Cabins, WV; two sisters-in-law, Norma Ours and Patti Ours of Cabins, WV and several nieces and nephews. Family will receive friends on Tuesday, December 19, 2017 from 6 - 8 p.m. at the Schaeffer Funeral Home in Petersburg, WV. Funeral service will be held on Wednesday 11 a.m. (December 20, 2017) at the Schaeffer Funeral Home Chapel with Bishop Ray Black and Pastor Yvonne Black officiating. Interment will be in Maysville Cemetery, Maysville, WV.